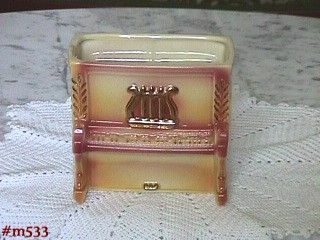 This listing has a beautiful Shawnee planter shaped like an upright piano! As with all Shawnee pieces, the colors are outstanding -- soft yellow with rosy/mauve accent color. This one has the added beauty of gold accents! It measures 4 3/4" tall, 5 1/2" long, 3" wide (at planter opening), and bottom is marked USA, 528. Planter is in wonderful condition -- appears to have been never used as a planter. It has a tiny ding/flea bite on bottom (underneath) rim and has a 1/8" production stress on 1 end rim/edge -- neither are detracting in any way! This is a lovely planter and an excellent addition to a collection!